I rarely post Isaac and I’s little conversations on Facebook, but this one was just too good to hold in. So if you follow me on the ‘ol Facebook, sorry you’re seeing this again. But this version has pictures, so there’s that! Some husbands say the sweetest, most romantic things in the mornings. With no makeup on and messy hair, they manage to make you feel flawless. 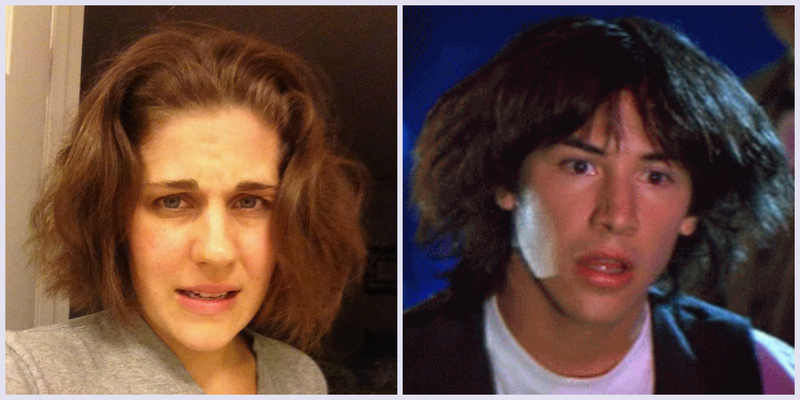 A few mornings ago, my husband sweetly tucked my hair behind my ear and whispered “you look like Keanu Reeves in Bill & Ted’s Excellent Adventure.” He really has a way with words. The worst part? He was pretty spot on. PS try not to fall in love with me based on this picture, I swear I don’t always look so effortlessly beautiful. I guess the puffy-faced, jaundice fairy visited me in my sleep. Such a gem! ← Who Needs LSD To Hallucinate? I look pretty scary in the morning, but I’m more like Jack Nicolson scary. LOl I hope you get his fantastic eyebrows too! Nope just his evil stare.